Let It Be: A Celebration Of The Music Of The Beatles is returning to the stage in 2019 with a series of new tour dates announced in a year that marks key anniversaries in Fab Four history. The acclaimed theatrical concert, which features an all-new Let It Be Part II reunion concert, proved such a hit with audiences and critics alike when it was premiered last year and a sell out European Tour, that it is now returning for a new UK Tour through Spring 2019. 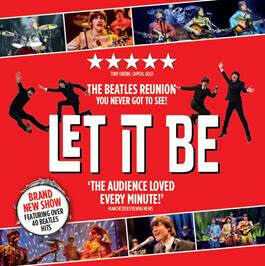 After opening in Portsmouth on 22 April, Let It Be will then visit Inverness, Glasgow, Aberdeen, Blackpool, Bath, Bradford andNorwich. Let It Be is a celebration of the iconic music of The Beatles and has already been seen by more than two million people worldwide, including a run in the West End and two UK tours. Audiences are taken on a memorable and unique step back in time to the reunion concert taking place on 9 October 1980 – it’s John Lennon’s 40th Birthday. This is the ultimate concert that never was. The band reunite for one night only, just Imagine.